Q. What is a denture ? Q. What types of dentures are there ? Q. How are dentures held in place ? The first thing your cosmetic dentist will do at your initial meeting will be to examine your mouth and gums to decide your suitability for having dentures fitted. If you have a few existing teeth it may be that some of your existing teeth may need to be removed first. If this is the case your cosmetic dentist will explain the reasons why your teeth need removing before proceeds to the impression stage of the treatment. The extraction of any any teeth can usually take place at your initial appointment. The last stage of your denture treatment is for your cosmetic dentist to create a mould of your gums using a special dental material specifically for this purpose. The mould will then be used as a guide to custom create your dentures to fit your mouth and gums perfectly. It is important to make sure your denture fit correctly at this stage as incorrectly fited dentures can cause many problems including discomfort and difficulty eating food. Q. How long do dentures last ? As you age your dentures can begin to feel loose as your gums shrink back and your bite pattern changes. If the problem becomes severe it may be that you need a new set of dentures measuring and fitting. However in some instances it is possible that some simple modifications to your existing set of dentures may rectify the problem. You should always make sure you take care of your denturs and clean them frequently. The length of time your dentures last also depends on how much use you give them as they will suffer from natural wear / tear as time goes by. Q. How Do I Care For My Dentures ? Even though you no longer have natural teeth, you must still take good care of your mouth. Plaque will form on your denture and food can get trapped between the denture and your gum tissue. After each meal, remove your dentures and, using a soft toothbrush, brush your gums, your tongue, and all sides of the denture. 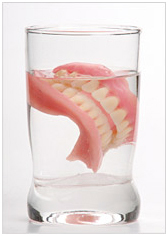 Here are a few helpful hints about caring for your dentures: Dentures are fragile and can break if dropped. It is a good idea to clean your dentures over a sink filled with a few inches of water, or a folded towel laid over the counter top. Dentures may warp if they dry out. When your denture is not in your mouth, be sure to store it in a denture bath filled with denture cleaner or water. Denture adhesive may be used to assist the retention of your denture, but should not be used with a poorly fitting denture. Poorly fitting dentures should be relined or replaced. Q. Will I be able to eat with my dentures ?